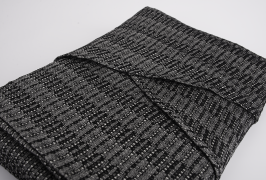 Phlox Midnight is woven with rich, deep black thread on our natural ivory warp. I have to admit that Phlox is probably my most favorite Dobby. It is nubbly and soft and has such a good hand feel. 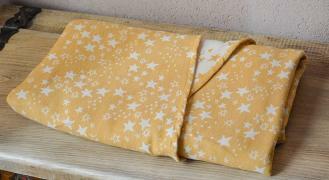 It’s one of those wraps where I still have the original sample and I use it as my everyday blanket when I’m sitting on the couch reading to the boys or when I’m curled up in bed reading or just need a light cover when I’m being lazy in the hammock in the backyard. It feels good and it looks good. It may be bright, but this wrap has sleepy dust in spades. Want one for yourself? This wrap will be available via a random draw on the Wrapture Facebook age from 6pm Friday 22nd February - 6pm Saturday 23rd February (Australian Eastern Standard Time) with invoices sent soon after. Vibrant and joyful with stunning drape, this technicolour dream is soft and cuddly enough for a newborn yet strong enough for your toddler. The geometric design is bold and slides smoothly into place, while the graduation of colour and rainbow hues soften the pattern and highlights the silky sheen. Sunsets in the Alps can be fascinating, the mountaines seem to be bathed in hues of glowing reds and blues. The colours of thisgorgeous natural spectacle are captured in our Prima Alpen Fire for which we blended lampone red with yarns in Ecru, Turquoise, Ocean and Medium Blue. Though intense, the dyes are non toxic and absolutely free from any harmful substances, the cotton yarns meet highest organic standards. Prima Alps Fire is as soft as all Prima wraps and a bit fluffy. 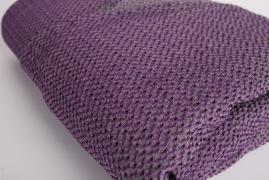 It has a slightly grippy texture that is ideal to hold knots firmly in place whether you wear a newborn or an infant. 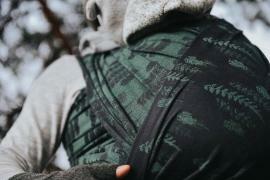 It is suitable to carry babies of all ages and stages, for wearers of all shapes and sizes. 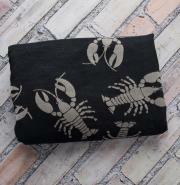 What better way to start the holiday season than with lovely crustaceans? Ok—I can maybe think of a couple of better ways, like say with apple cider mimosas * ahem * But really, a huge helping of lobster is part of our holiday celebrations the Lobsters Dusk seems fitting for this time of year. 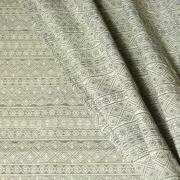 Lobsters Dusk is woven on a black combed cotton warp with a mercerized natural cotton fill. It’s the lobbies you love to love, but this time in a decidedly delicious black and white. It’s the perfect neutral for the holidays when gaudy colors, sequins, tinsel, and glitter abound around every corner. Woven for Pavo Textiles by the brilliant team at the Oriole Mill and finished by the amazing crew at a Sew Co in beautiful North Carolina. We hope you love your Lobbies the tiniest bit spicy and hot! We know we do. 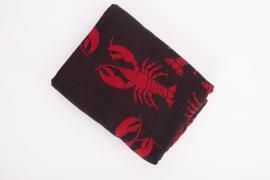 Spicy Lobsters is woven on a black combed cotton warp with our red cotton fill. It’s the lobbies you love, but with a bit of heat to celebrate the day of love. 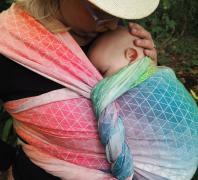 After receiving many-many requests for a consultation wrap we are offering today a special pre-order especially designed for babywearing professionals like consultants and midwives or sling librarians. 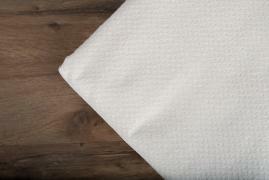 All wraps are 100% organic cotton, light weight with around 220 g with two different colored sides and two different rails (one the color of the dark side, one the color of the light side). Colors available for this pre-order: royal dark blue (first sample picture), turquoise/lagune (second sample picture) and corn yellow (yarn picture). From the 3 options only the options will be woven which have at least 10 orders. Please make a priority list if you could imagine more then one color! 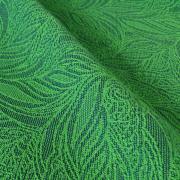 Linnent is 100% cotton (225gm2) and looks deep teal/bottle green, on an almost midnight blue/charcoal warp. 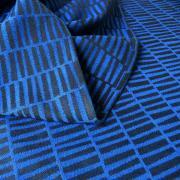 Modern, graphic pattern, woven from blue and anthracite cotton yarns, a colour interplay that adds style and classiness to the pattern. 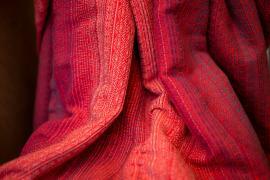 A Jacquard weave, the pattern appears on both sides of the fabric but with the colours reversed adding to the intrigue of this woven wrap. 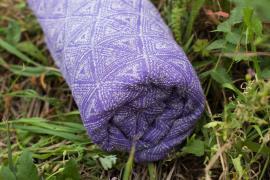 Like all DIDYMOS woven wraps, Blue Bricks is also a highlight when it comes to sustainability and reliability. 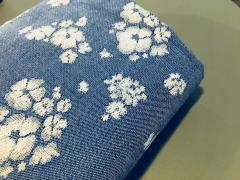 Made from 100% organic cotton and dyed with non-toxic dyes, it is absolutely free from any harmful substances. 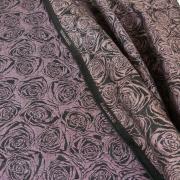 The medium weight fabric with its inherent diagonal stretch is supportive and wonderfully comfortable and easy to tie.